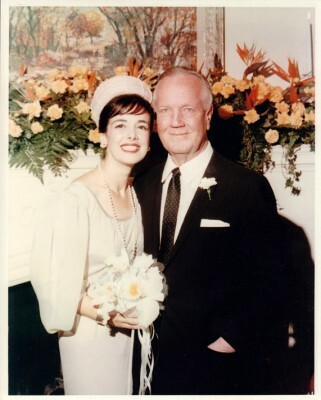 WEDDING of Howard Ahmanson and Caroline Leonetti at Robert Ahmanson’s home in 1965. Southern California’s population exploded in the 1950s, demand for homes and mortgages surged and the savings and loans industry flourished. At the heart of this financial boom was Howard F. Ahmanson. The cigar smoking, Omaha native helped millions of regular folks own their own home, and he would spend his riches expanding the city’s cultural institutions. 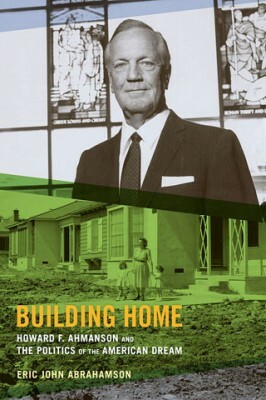 His story is told in a new book, “Building Home: Howard F. Ahmanson and The Politics of the American Dream.” The 357-page biography by economic historian Eric John Abrahamson chronicles the life of the post-World War II California businessman and Hancock Park resident. He lived on June St., and later S. Hudson Ave. in a Tudor-style mansion. Founder of Home Savings—the largest savings and loan in the country in the 1950s—he was one of the country’s richest men. NEW BIOGRAPHY of founder of Home Savings. of the 1950s, when 42 percent of the populace owned a home. The pursuit of the American Dream set the stage for the housing bubble in 2007, and entrepreneurs like Ahmanson helped shape public policy and build their empires, states the author, Abrahamson, who has a Ph.D. in American history from John Hopkins University. Howard’s father William H. was an Omaha insurance executive who would discuss business with his son after dinner “as if I had the maturity and judgment of a man of 50,” Howard would recall. His father’s death in 1925 would spark the younger Ahamnson’s drive to realize his father’s ambitions. Howard started an insurance agency in 1926 when he was 20 and a student at USC. He made his first $1 million during the Depression and would continue to become one of the most successful entrepreneurs of the last century. He married Dorothy “Dottie” Johnston Grannis, a secretary for Paramount producer David O. Selznick and a USC student. His second wife, Caroline Leonetti, was a regular on Art Linkletter’s radio program giving fashion and style tips and opened a talent agency with clients including Jane Russell and Kim Novak. Ahmanson was drawn to her beauty and her entrepreneurial spirit. He did not set out to be a philanthropist, but that would change, noted the author. Los Angeles was the “quintessential” postmodern city after World War II, and Ahmanson was at the helm. In 1952 he created the Ahmanson Foundation; his two nephews Bill and Bob and his first wife were on the board. He wrote a $2 million gift to LACMA in 1958 and joined its board in 1960. He was elected to the USC Board of Trustees, and when neighbor and fundraising powerhouse Dorothy Chandler called, he got on board the Music Center’s Building Fund Committee. The Ahmanson Theatre opened in 1967. Ahamanson died in 1968 before his Ahamanson Center office building broke ground at 3700 Wilshire Blvd. His widow, Caroline Leonetti, would continue to work for art and school pursuits until her death in 1996. Her dream to start the Los Angeles County High School for the Arts was realized when it opened in 1985 on the campus of Cal State Los Angeles. Her daughter, Margo O’Connell, Hancock Park, and granddaughter, Cara Esposito, Larchmont Village, are on the school Foundation Board. The book is published by University of California Press and available at www.buildinghome.com.